The Cleveland Cavaliers opened the offseason facing 60-1 odds to win the 2014-2015 NBA championship. Vegas.com now lists them at 16-5, making the decided underdog the favorite of all 30 NBA teams. Adding a new coach, Kevin Love, and, oh yeah, LeBron James will have that effect on a team. With 25 days until the season’s tip off, the book pegs the San Antonio Spurs at 4-1 to repeat. Oklahoma City follows at 13-2, Chicago at 9-1, and then the Los Angeles Clippers at 11-1. League longshots include the Milwaukee Bucks at 400-1 and the Philadelphia 76ers at 650-1. LeBron’s exodus from South Florida reversed the Heat’s odds from 5-2 to 60-1. 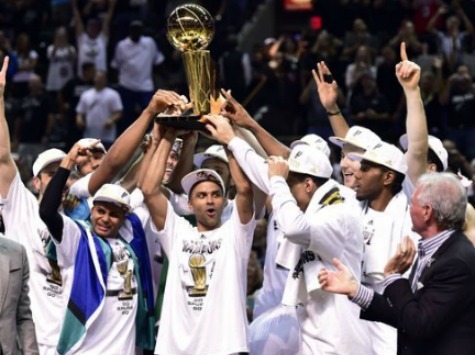 The San Antonio Spurs open the season on October 28 by hosting the Dallas Mavericks. The game marks the first opener in seven years not to feature LeBron James.